Jak got a chance to explore the Las Vegas Strip during his delivery! 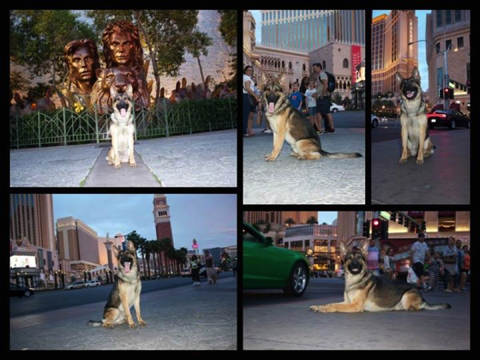 We recently delivered one of our Guardian Plus personal protection dogs to Las Vegas, NV. Jak is a sable male German Shepherd with unbelievable speed, power and focus. It has been a total pleasure working with him since day one, and his delivery was no exception: Jak quickly became accustomed to the fast pace of Las Vegas and fits right in at his new home. Jak is going to be keeping watch over the members of his family both in Nevada and away on business trips with his owner. The high crime rate in parts of Las Vegas make personal protection dogs an important layer of security. After all, no criminal with even an ounce of good sense would want to mess with a dog like Jak when there are about 600,000 other potential targets in the city. Before finding Jak, his new owner had researched many other companies looking for the best protection dogs to suit his lifestyle in Las Vegas. He had previously owned a protection dog from another company. Unfortunately, the dog ran out of his enclosure and was killed after being struck by a vehicle. This was a tragic example of how important functional recalls and stays in obedience training: with distractions around every corner, owners need to be 100% sure that their dogs will remain focused at all times. A big part of our protection training involves training in public, in places like Boston and Newburyport, MA so that our obedience and personal protection training will remain effective even in the presence of many people and vehicles. Jak is trained not just to keep his family safe and follow their commands in obedience, he was also shown the rules of the household during his thorough delivery process. He was taught car manners, house manners, and how to behave properly with visiting people and dogs. Below you can see two videos taken during our delivery process. The first shows the proud new Idaho owner of one of our personal protection dogs, Hans. You can see how this German Shepherd became part of the family, with even his young daughter being able to comfortably handle the dog in protection and obedience. The second video shows the delivery of Aspen, one of our Guardian Plus level personal protection dogs who now lives in Oklahoma, working in a variety of training exercises during his delivery. If you are interested in our Protector, Guardian or Guardian Plus training levels, we welcome you to browse our listing of protection dogs for sale.